James: Welcome to Rocket Reviews, where we critically review anything and everything. I’m your host James, and this is Mime Jr.
James: Since today is all about Hollywood and movies, this episode of Rocket Reviews will be focusing on the various movies, good and bad, across the history of Pokémon. You can count on us to provide with completely informed reviews, without any bias. James: We’ll be looking at three different movies today. The very first of these will be none other than the classic itself, Mewtwo Strikes Back. James: If you ask me, this might just be the greatest Pokémon movie there is, at least until the release of The Team Rocket Movie. Think about it, if it weren’t for Team Rocket, this movie could not have existed. Mewtwo, the very driving force and titular character of the film was created by the great and powerful Boss Giovanni. Then there’s the true heroes of the film, who are clearly those three handsome viking pictured above. If it weren’t for them, Mewtwo might just have gotten away with destroying the world. Above that, it’s Meowth and his clone who are the first to realize that they shouldn’t fight. James: Exactly. This is basically the prototype for the Team Rocket Movie. Until now, this is the closest to perfection a Pokémon movie has gotten. I’m sure many doubted that there ever would be something more perfect. I guess they were proven wrong to day, eh Mime Jr.? James: Anyways, this movie gets a 9 out of 10 when it comes to the plot impact of Team Rocket, an 8 out of 10 for its usage of Jessie, James, and Meowth, and a 9 out of 10 for its total Team Rocket integration. That gives this movie an aggregate Rocket Rating of 26 out of 30, giving it a very strong score. With score that high, it is heavily suggested that you watch this movie. James: Okay, next on our list is something a little more modern. It’s Kyurem Vs. the Sword of Justice. James: You’ve got to be kidding me! That can’t be it! This entire movie, and that’s how we appear!? You can barely even tell that that’s us! 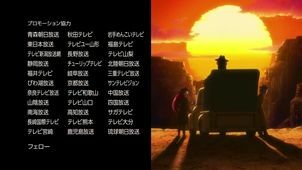 Aside from this one shot of us looking out at the sunset, we get a smattering of random cameo appearances, also wearing trench coats and hats. Mime Jr.: Mime mime mime. James: Exactly! Do the makes of these movies not realize what integral characters Team Rocket is to the Pokémon series? The scale of our appearances in movies may have been dwindling in the preceding years, but at least we had our own scenes and speaking roles! But here we got only the smallest of cameos! No respect whatsoever! I suspect that if it weren’t for our tenure, they wouldn’t have even put us in this one. James: And there’s something that really doesn’t make sense to me. I get it, in Unova we were going through a phase. A very strange and boring phase. But that doesn’t explain this. Here’s the thing, we had already ditched the black uniforms and returned to our fun-loving selves long before this movie came out. Heck, even the previous movie, which came out during the season that we were drab and dull featured us better than this. I don’t know what they were thinking. Makes no sense. James: *Deep Breath* Okay, sorry. Now that I got that rant out of the way, let’s give this movie its final rating. I’m afraid that across the board, for the categories of plot impact of Team Rocket, usage of Jessie, James, and Meowth, and total Team Rocket integration, this movie scores 0, zip, nada. That gives this movie an aggregate Rocket Rating of 0. Now, what does that mean? That means that this film is the greatest piece of trash to ever exist. You would be better off staring at a wall for an hour and a half than to watch this thing that dares to call itself a movie. If you haven’t watched this movie yet, be thankful that I watched it for you. James: Okay, now that that abomination is done with, it’s on to the most recent movie in the Pokémon franchise, The Power of Us. James: Oh? Who are these handsome devils? Clearly it’s us, but we don’t quite look right. Also, I don’t remember the events of this movie in the slightest. Clearly I’m there, as pictured, but I’m drawing a complete blank. James: Okay, after some research, I’ve found out that this movie supposedly takes place in a different timeline that the one I come from. Strange. I wonder how the producers managed to cross the dimensions to film this one. Mime Jr.: Mime mime. Mime mime mime. Mime, mime mime, mime. Mime-mime mime. Mime mime, mime. Mime mime mime, mime mime. James: Maybe… Anyways, this film was a breath of fresh after the last one. While, strictly speaking, it might not feature the Team Rocket you know and love, it essentially does. Not only that, but alternate Team Rocket serves as not only the villains of this film, but the heroes. You see, it’s due to the direct actions by alternate Team Rocket that the city becomes overrun by the essence of Effect Spore. There is no true villain in this movie, making alternate Team Rocket the closest things. This also marks the first time in Pokémon history that Team Rocket, any version of them, have been the direct cause of a movie’s conflict. At the same time, it is only this version of Team Rocket’s Lum Berry juice that saved the city. Team Rocket drove this plot exactly like they deserve. I extend my congratulations to that timeline’s Team Rocket. They have achieved something great. James: Of course, that’s nothing compared to what we will achieve in the upcoming Team Rocket Movie. Anyways, on to the Rocket Ratings. For Team Rocket plot importance, this film scores a 8. For usage of Jessie, James, and Meowth it scores a 6. And for total Team Rocket integration, a score of 7. That gives the movie an aggregate score of 21 out of 30, a fair score. 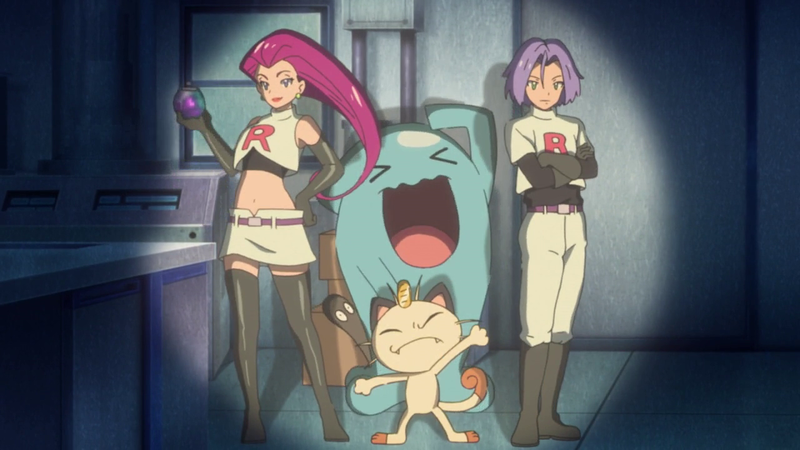 One of the main reasons this movie didn’t score higher is that it inexplicably chose to use a different version of Team Rocket than us, meaning that it went for sub-par replacements. Despite that, this movie still ranks well. If you haven’t seen it yet, we suggest you do. James: And that’s it, that’s all of our reviews for today. We hope you enjoyed Rocket Reviews. If you have any questions, be sure to leave a comment and ask. We’ll answer during the Team Rocket Q&A Session later today. I remember way back in a review of one of my episodes that I made promise that I would try to use Brock better in my series than he was used during the later half of his run in the show. It may be nearly 70 episodes later, but I like to think that I am now fulfilling my promise. I completely admit that I let Brock drift to the side and haven’t given him anywhere near the focus he deserves. For real this time, I promise that that will change now. The concept of this episode is something that I’ve been toying around with for quite a while now. I realized that if I were to redefine Brock’s goals just a little bit, and gave him some sort of equivalent to a trainer earning badges or coordinator ribbons, that he could be written in a much better way. Of course, that left me with the question of what that should be. How does a Pokémon doctor-in-training go about having physical representations of his progress akin to a badge? Obviously it couldn’t be any sort of competitive nature, as being a doctor should be anything but competitive. But without competition, where would the drama come from? I even considered just forgetting the doctor stuff and having Brock enter Pokemon breeding contests, something akin to real-world dog shows, but decided in the end that that would just be backwards progress for Brock. I needed something that would progress him towards his current goal of being a Pokémon doctor. Finally I settled on what you see in this episode. The curing of previously-incurable ailments to earn a medical degree without the normal schooling. One thing that works quite well about it is that it helps me justify taking Brock out of medical school and putting him back in the field. My previous excuse was tenuous at best. Speaking of, that was the other big purpose of this episode, fully justifying why Brock’s time isn’t better spent in medical school. It was all designed to prove that he gets just as valuable experience, if not more, traveling around the world with Ash. We’re entering a new age with Brock here, and hopefully it’s a change for the better. One other topic I want to address quickly is Team Rocket’s appearance in this episode. In case you didn’t understand the blatant joke, the entire scene was making fun of the fact that it’s essentially a rule that Team Rocket has to appear at least once in every episode (unless said episode takes place in Unova, which is a major part of the reason why Unova was my least favorite series). The reason I made this joke is because when trying to figure out how to work Team Rocket into this episode, I realized that I was literally just shoehorning them in like people often complain about. Personally, I want to see them every episode, even if they are shoehorned in, but I decided that this would be the perfect time to use Team Rocket’s outrageous personality and ability to break the fourth wall to make light of the scenario. Safari Zones (and variants thereof) seem to pretty much be ignored in the anime, with the exception the episode in Kanto (which was banned). Hoenn’s Safari Zone was completely ignored while the Great Marsh in Sinnoh was used simply as the location for a random episode, the fact that it was used for Safari Games was never addressed. As Cosmic Quest is the main way to show off my ideas from Luna, Terra, and Sol, I didn’t want to leave the Park Zone out. Speaking of the Safari Zone in the anime, just as I did previously with the Porygon episode, this episode featured a joke where Ash forgot about the events that took place during a banned episode, reflecting the fact that most English viewers would have no idea what they’re talking about. Another joke this episode made was Ash failing to catch a Dunsparce. For some reason it would appear that whenever Ash tries and fails to capture a Pokémon that it’s a Dunsparce. This has been seen twice now, once in the Unova episode The Path that Leads to Goodbye and again in the Kalos episode Under the Pledging Tree. I figured if I was going to have Ash fail to capture a Pokémon, that I might as well continue the joke and make it a Dunsparce as well. An interesting fact about this episode, and the Pokémon featured in it, is its origin. Traineed and Arborrior are actually two of some of my very earliest Pokémon (alongside “Megachu,” Delphin, and Ivine). As a child when I created these Pokémon, I would play make believe with my friends using them. One scenario that I always reused was that the person I’m playing with would be training by attacking a tree, and out of that tree a group of Traineed (back then given the uninspired name of Seedona) would fall. One of these feisty Pokémon would challenge the trainer and end up finding a Leaf Stone (the original evolution method that I recently changed) and evolve into Arborrior (known as Treeona back then). This event would always occur before the trainer fights a Grass-Type gym (this was in a proto-region I created before Tenno). Wanting to give the trainer a Pokémon that is good against Grass-Types, I would have the captured Arborrior know Fire Punch. I took this original scenario and transformed it into this episode. If I had been able to write a longer episode, then there would have been one final battle between Arborrior and Breloom, representing the battle against the Grass gym leader. Finally, I want to take this chance to give my opinion on Safari Zones. I’ve seen a lot of people complain about the Safari Zone and how annoying it is. I personally cannot agree with this at all. Not only do I not think it’s too difficult, but I think it’s a great thing to have. It is an area that completely changes all of the conventions about capturing Pokémon, leading to a completely unique experience found nowhere else. It adds variety to the game, and I really don’t know how that can be a bad thing. I personally hope strongly that Sun and Moon sees the return of the Safari Zone, and I don’t mean excuses like the Friend Safari or that pale imitation we see in Omega Ruby and Alpha Sapphire. I want an actual Safari Zone with an actual Safari Game.